Production is an important part of business, because after all, what you produce is what keeps customers coming back! Control offers many tools to help ease the burden of tracking and producing multiple projects at once. Clock In/Out Clocks the highlighted employee in or out for the day. Your employees will use this screen to verify that they have spent a specified amount of time working on one particular project. The Employee will have to enter their password in the upper left hand corner as their means of verification. The Order Number must be entered in the top right corner of the screen. 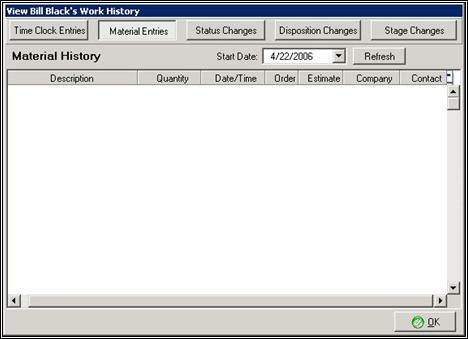 If the order number is not known to the employee, it must be selected from a list in Explorer. The Employee can then make changes to the Labor Time. Add- Add New Line Item to the Order. Delete - Deletes Line Items from the Order. To add a new Line Item to an Order, first click on ADD. By clicking on ADD, you will be brought to a screen that looks like this. After selecting a line item to add, click OK. By clicking OK, you will be brought to a second screen that actually allows you to select which Line Items you would like to add. To select the new Line Item, click on the category at the left, then select the part from the list below it. Click on the Add button then select OK. This will add the new Line Item to the order. By clicking on View Part, you will be brought to a separate screen. In this new screen, you will be able to view numerous things, such as the part name, part type, quantity, etc. The View Part screen is shown below. Any text that has been added as notes will be shown here. By clicking on Update Part Cost, a new window will open that looks like the one above. In the text field, you can enter the new unit cost. By clicking OK, the new cost will be set. By clicking on Clock On, a new window will open like the one above. All time card statuses will appear allowing you to choose a time clock status. After choosing a time clock status, another window will open. It will have the employee's name as well as a text field where a password must be entered. By clicking ok, a time card window will appear like the one below. 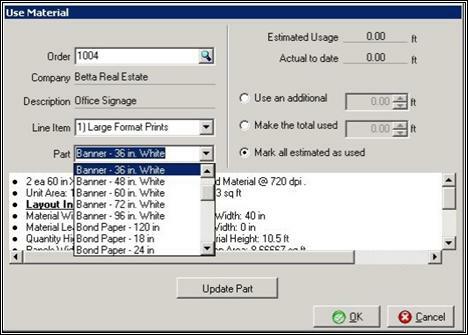 The time card allows the user to enter any additional information, such as any notes that might be handy for the next employee to work on the part. After clicking OK at the bottom of the timecard, the employee will be clocked on. 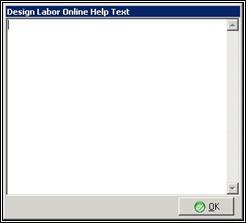 The Column Chooser allows the user to select which columns will appear on the Confirm Labor Time Screen. Any column name that you check will be shown on the screen. You can also specify where the columns are order wise by using the move up and move down buttons. By clicking on the move up and down, the highlighted column name will move up or down in order. You can also set each column width in pixels and the number of columns that can be frozen, or locked, in place. For example, if you choose two columns to be frozen, the first two columns will remain in place when you scroll horizontally. 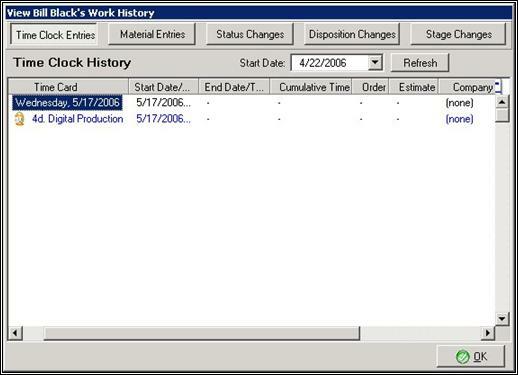 Managers can use this box to re-assign an employee to a different project and add production notes as required. 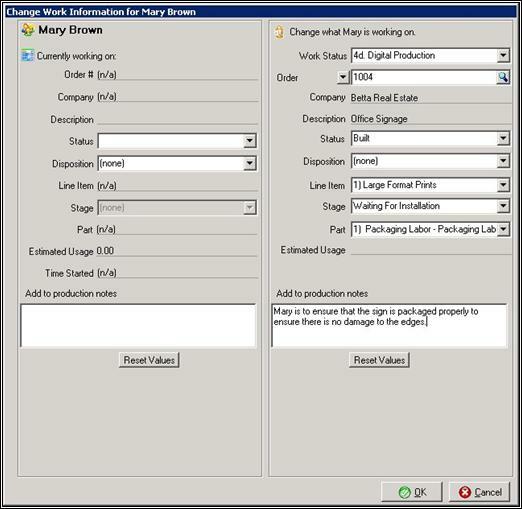 The left side of the screen shows which project the selected employee is currently working on. 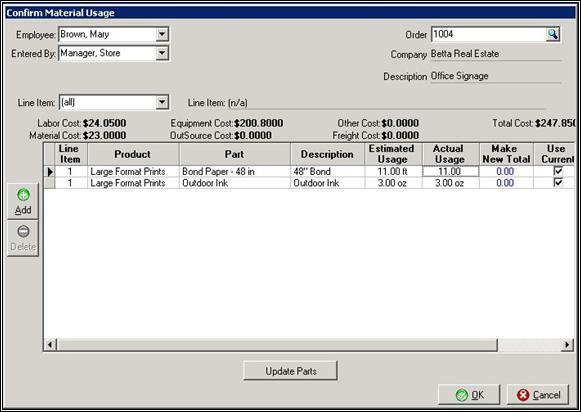 On the right side of the screen, you can select information for which project you are re-assigning the employee to. Enter or search for the order number you want the employee to work on. Make sure this value auto populates in the Order box. Add any additional information to the production notes. The employee will receive an alert that they have been reassigned. 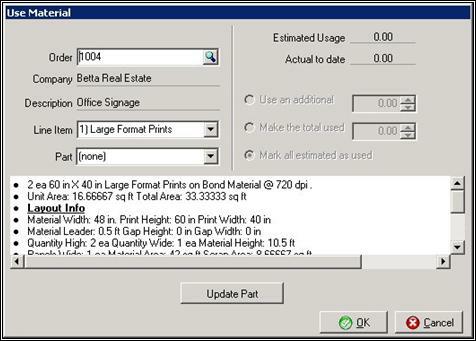 Use this screen to confirm how much material you are using for a particular project. This allows managers to verify if material amounts for a project are running higher than usual. This screen will show the line items for selected orders. It will show the product, part, description, estimated usage, and actual usage. To add a new Line Item to an Order, first click on Add. By clicking on Add, you will be brought to a screen that looks like the one above. The User can access their work history here. They can view specific information about materials used, status changes, disposition changes, and stage changes. 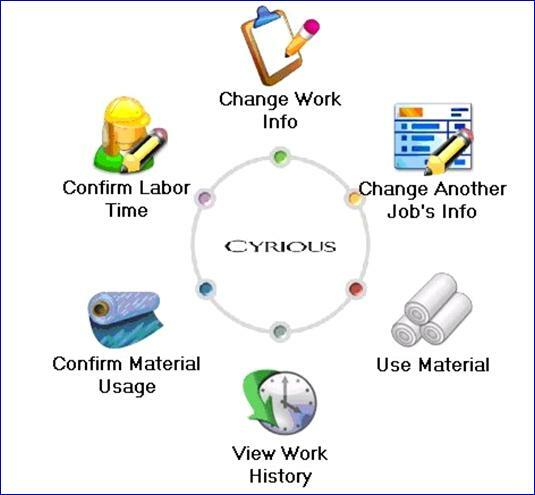 By clicking on Material entries, the user is able to view all material entries for the employee. By clicking on Status Changes, the user is able to select a date to view the employee's status changes. 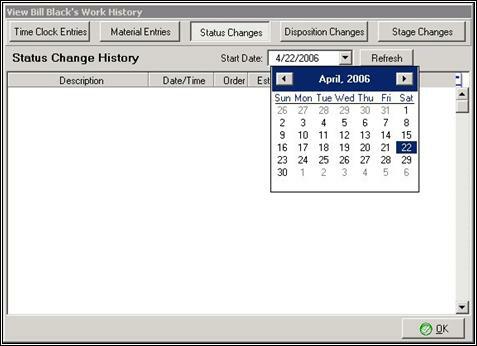 All of the employee's status changes for the date selected will appear. By clicking on Disposition Changes, the user is able to select a date to view the disposition changes. All of the disposition changes for the date selected will appear. By clicking on Stage Changes, the user is able to select a date to view the employee's stage changes. All of the stage changes for the employee for the date selected will appear. 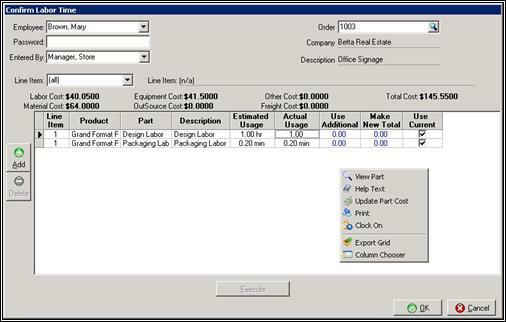 Use this screen to add material to a previously entered order. First enter the order number or search for it by clicking on the small magnifying glass. 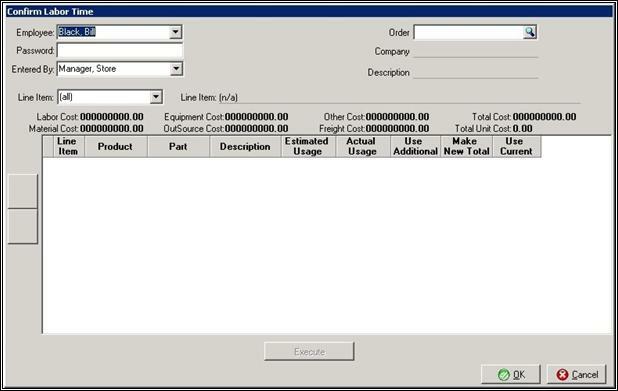 Then the user is able to edit the parts and amounts used. To finish, click UPDATE PART and OK. This screen shows the drop-down list that the user will see when selecting a part. 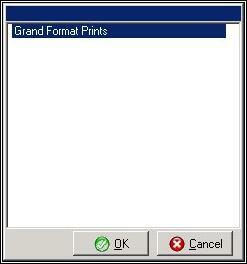 The user is able to select a part to add from the list. The Production Home page is a one-stop venue for everything a shop employee needs to work efficiently. They can monitor how they are distributing time and take note if there is anything that needs to be changed.